Gluten-Free Breakfast Scones - A recipe from Savor California, the online showcase for extraordinary gourmet foods and beverages from California. Combine flours, sugar, baking powder and salt. Slowly add Salute Santé! 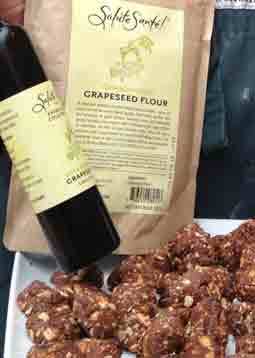 Grapeseed Oil while mixing on low speed until crumbly. Add raisins, dates, nuts and oatmeal. In a measuring cup, beat the egg and milk together. Slowly add to dough while mixing on slow speed until thick. Form 2-inch balls and place on greased baking sheet. Bake for 10-15 minutes or until lightly golden brown.